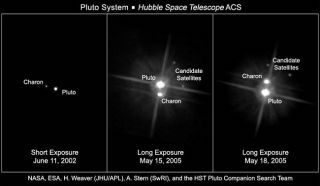 Hubble images revealing Pluto, its large moon Charon, and the planet's two new satellites. The candidate moons aren't visible in the short-exposure image [left], but can be seen in the middle and right-hand images. TheInternational Astronomical Union has officially christened Pluto's two newestsatellites Nix and Hydra. The tiny satelliteswere discovered by the Hubble Space Telescope last May and are believed to havebeen formed from the same giant impact that carved out Charon, Pluto'sthird satellite, discovered in 1978. The nameswere proposed this spring by the team that discovered the satellites. Beforethe satellites received their official names, the satellites were called P1 andP2. In Greekmythology, Nyx was the goddess of the night and themother of Charon, the boatsmanwho ferried souls across the River Styx into the underworld ruled by Pluto. TheIAU changed the spelling to "Nix" after the Egyptian spelling of thegoddess to avoid confusion with two asteroids that had already been named"Nyx." Theoutermost of Pluto's two new satellites is named after Hydra, the nine-headedmythological serpent that guarded Pluto's realm. "Wethought it was an appropriately scary image to be the guard at the gate,"said Alan Stern, an astronomer with the Southwest Research Institute who ledthe team that initially discovered the satellites. In additionto their relation to Pluto, the names were chosen because their first initials,"N" and "H," are also the first letters of New Horizons,the NASA spacecraft launched in January towards the Pluto system. The HubbleSpace Telescope was providing support for the New Horizons mission when itspotted the tiny satellites. "The 'P'and the 'L' in Pluto are in honor of the Percival Lowell, who instigated thesearch that resulted in the discovery of Pluto," Stern told SPACE.com. "The 'N' and the 'H' are exactly parallel to honor New Horizons whichinstigated the search that led us to [the new satellites]." Stern, who leadsthe New Horizons mission, also considered the name "Cerberus," thethree-headed hound who also guarded the gates to Hades, but rejected it becausemany people associate Pluto with the Disney cartoon character, and having oneobject in the system named after a dog was enough. The newnames were reported yesterday on ScienceNOW.org,a publication of the American Association for the Advancement of Science. Aformal announcement will be issued Friday, June 23.